Usually I am skeptical of restaurants in Washington, DC’s Chinatown but New Big Wong has built a reputation as a spot where chef’s and restaurant staff gather for late night Chinese food – Mike Isabella (of Top Chef fame) and Nick Stefanelli are known to head there after hours. New Big Wong came into existence in 1992 when Michael Weng bought Big Wong and changed up the menu from purely American-Chinese to a mix of American-Chinese and Traditional-Chinese dishes. There is apparently also a informal menu of dishes that can be ordered for those in the know. I recall eating at Big Wong back in the day and being underwhelmed by the food, especially compared to what I was getting in NYC’s Chinatown. 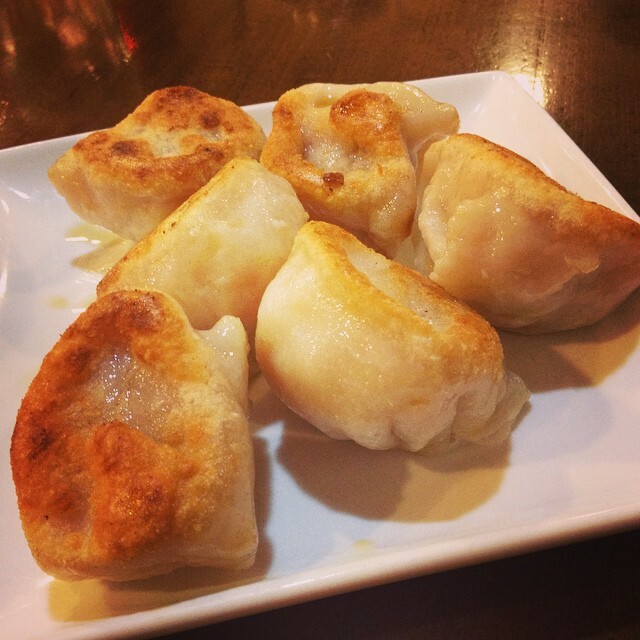 The Dumplings: Steamed or fried meat or vegetable dumplings are available on the appetizers portion of the menu. The fried pork dumplings were pretty standard tasting pan-fried dumplings but the meat inside was a shocking pink color that made my dining companion ask me if the filling was still raw. It wasn’t, but it was pretty weird looking. Considering what I had read about New Big Wong’s expanded menu of traditional Chinese options I was surprised to only see two varieties of dumpling on the menu, but maybe there are more on the informal menu for those in the know. The Dipping Sauce: As with the dumplings, New Big Wong serves up a pretty standard soy-vinegar dipping sauce with a touch of sesame oil. Each table has three tubs of additional sauces: sambal style chili oil, Chinese mustard and a sweet apricot sauce. The Location: New Big Wong is located in the heart of DC’s Chinatown on H Street NW between 6th and 7th Streets. DC’s Chinatown seems to be shrinking, there are more U.S. chain stores and restaurants with Chinese affectation lettering on the signs than there are legit Chinese restaurants and stores. This entry was posted in Chinese, D.C., Pan Fried, Pork. Bookmark the permalink.